Thanks Martin, you're a legend! My calculations for my project dinghy (a 14' Wanderer; approx 120kg) indicate that the biggest righting moment is the crew hiking out. I understand that the Finn dinghy is designed for large men who will be hiking a long way out in windy conditions. From the pictures, your dinghy doesn't seem to have side decks so I assume you are not planning on hiking out as part of normal sailing? Thus you won't break the mast unless you plan on sailing your dinghy in windy conditions with a couple of large crew hiked out. I found the class rules on the Finn dinghy here: http://www.sailing.org/tools/documents/FINNCR110618-.pdf. This gives the max section as 60mm side-to-side and 100mm fore-and-aft. This is big enough given its design load. I do have some notes on my design process for my Wanderer mast on my blog. There are some tables on Aluminium tube strengths you might find useful. TBH mast material selection seems to be mostly a question of "what can you get hold of cheaply where you live?". Do you know the section of the proposed mast at the partners? The mast is going to be the most challenging item to secure for my dingy so I am thinking about what might be available. I suppose a noodley mast presents the opposite problem to that of noodley battons. Battons are flat in light breeze when you want camber and bend when the going gets tough and you would like less drive. A noodley mast would spill more air as the wind speed picks up. It probably depends on how you intend to use your boat. My dinghy mast is extremely flexible (it is an aluminium windsurf mast in a heavyweight 12' GRP hull) but this works fine. I'm not looking to go fast and I'd rather have a forgiving response to gusts. I was thinking about suitable masts for my dingy and I realised that I could probably procure an aluminium Finn Dingy mast. Not knowing the actual dimensions of a fin mast myself I thought I'd ask what you guys think? I suspect it might me a little to bendy/flexible to work on a dingy like mine. Size of rudder - a large efficient (NACA profile low aspect ratio) rudder can correct a lot of issues! 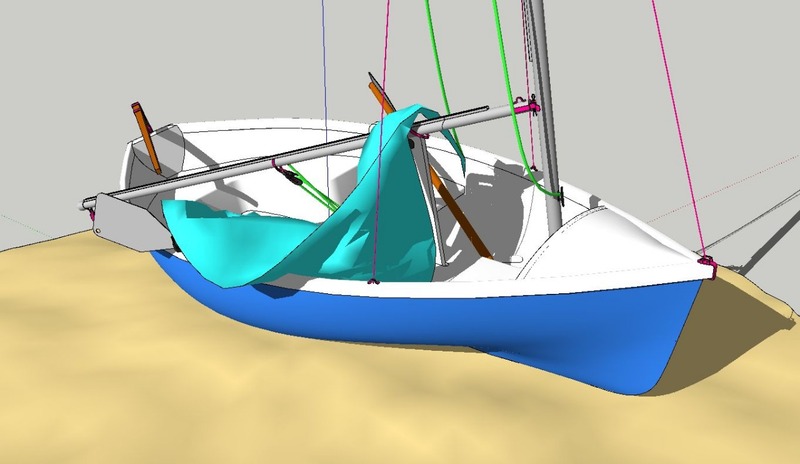 Type of junk rig - some sail designs can adjusted fore-and-aft easily. Others (e.g. split junk) are more difficult to adjust. The CoE is a guess that only applies to some points of sailing so can only be approximate at best, so don't worry too much. 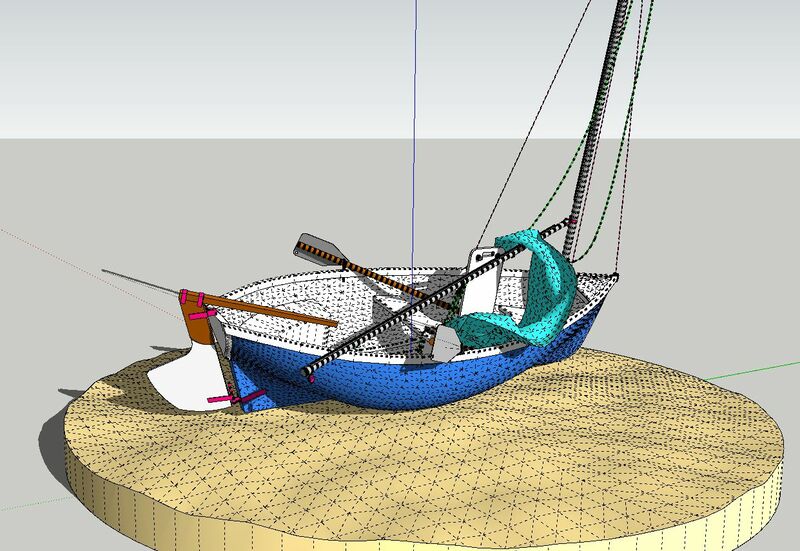 I suspect that you'll be very happy with your junk rig on your dinghy (I am with mine - makes it a joy to sail!) so the key thing is to build it and try it out. You won't get everything right first time - there are a lot of details to puzzle out in the rig - but it works so well that it is worth doing despite any issues in your first attempt. Thanks for commenting Martin, I was just wondering whether the CE of the Bermudan and Junk rig would be the same because as it turns out the underwater sections of the 3D model my mate made was not very accurate so I have doubts that the cutout method would work. I could probably get the mast/boom/sail measurements from him. A good starting point is the CoE of your mate's rig. Can he provide drawings of his rig? I solved the problem of my hard copy of PJR being thousands of km away by purchasing an electronic copy of PJR, I wish there was one when I was looking to buy my hard copy, which was quite an ordeal and not to mention expensive. I managed to get a nice side view of the hull design and finally learnt the design and designer's name. The dingy is called a Loche Fyne and was designed by the South African yacht designer Brian Lello. I wonder if guessing the waterline would give me the incorrect CLR which I plan on finding via cutting out the underwater section and finding its balance point? I am planning on making three guesses on the waterline and then working out the CLR, if the solutions vary then I plan on averaging them to make an educated guess. I am committing myself to having refitted my Miura by 2022. In the meantime I need to design and build her rig. I work abroad and only get back home for 7 weeks every year over summer break (Jul -August). I have a substantial bare dingy hull I have used for a number of years as our workhorse marina tender but a mate of mine has the identical dingy hull which is completely rigged and which I have envied for a long time. I think going through the process of designing a rig for my hull and building the sail here and rigging the hull next summer would be a good learning experience for the bigger project. In the absence of my copy of PJR which I left at home I am planning on using Arne's 'book' to design and build her rig. 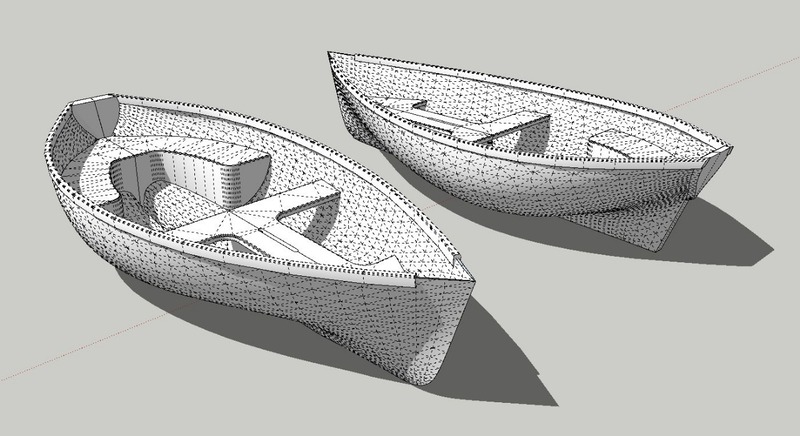 Step one is to do a bit of mocking up using scaled sketches the hull to determine things such as CLR and CE. However, how do I get such hull drawings if I don't have them? Bare in mind I'm on the other side of the planet from my hull right now. This is the beginning of a long learning process for me so please excuse my lack understanding of the most rudimentary of things.